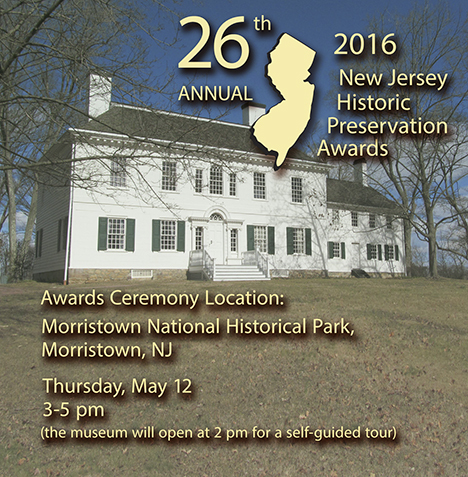 Seven recipients of the annual New Jersey Historic Preservation Awards were honored at a ceremony on May 12, 2016 held at the Morristown National Historical Park in Morristown, New Jersey. Celebrating May as National Historic Preservation Month in New Jersey, the Department of Environmental Protection’s Historic Preservation Office and the New Jersey Historic Sites Council presented the competitive awards honoring projects, groups and individuals dedicated to preserving the State’s architectural, archaeological, and cultural history. This year, New Jersey not only commemorates the 26th anniversary of these prestigious awards, but it also joins the rest of the nation in celebrating the 100th anniversary of the National Park Service and the 50th anniversary of the National Historic Preservation Act. The award-winning 2016 candidates illustrate valuable historic preservation work on national, state, and local levels. They incorporate significant economic development, job creation and community reinvestment in some of New Jersey’s most urban neighborhoods and small towns, as well as compelling rehabilitation work of resources important within the context of New Jersey’s contributions to the heritage of our country. The Dey Mansion is Passaic County’s premier Revolutionary War era museum, constructed circa 1772. Its lasting fame is as a military field headquarters for General George Washington, who occupied the building during July, October, and November, 1780. This imposing high style Georgian building was restored for museum purpose in 1933-34, and is listed on both the New Jersey and National Registers of Historic Places. Restoration was necessary, not only to repair the naturally occurring ravages of time, but also to correct subsequent cosmetic and minor repairs that detracted from the authenticity of the visible fabric. John Milner Architects, Inc. lead a team of preservation specialists through an in-depth investigation phase that included review of historic documents, conditions assessment, structural assessment, dendrochronology, finishes analysis, and archaeology. Major work categories include structural repairs and stabilization of roof framing and masonry gable end walls, roof replacement, masonry repointing, window restoration, flooring restoration, plaster repairs, and painting. Mechanical and electrical systems were replaced. Site improvements include the introduction of French drains and seepage pits to handle rainwater evidence. The grade was raised along the north-side of the building to provide accessible entrances at both the kitchen wing and main house. This was achieved by dry-laying mortarless retaining walls constructed of stones salvaged from the site. A separate Visitors’ Center is planned for a second phase of the project. This comprehensive restoration and rehabilitation project has renewed the Dey Mansion as an educational and interpretive historic resource for coming generations. 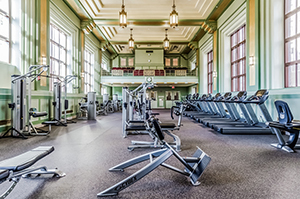 Although not in New Jersey, the preservation of the Clara Barton Apartment is a significant site nationally, and we take pride in the fact that a New Jersey firm has accomplished this exceptional project. Originally submitted for the overall completion of the project itself, the members of the awards jury felt that the award should instead be presented for the documentation and preservation planning documents. The attention to detail required, and the necessary coordination with both government and private entities is an excellent indication of the necessity of innovation and the complicity of preservation. During the Civil War, Clara Barton’s rooms in a middle class rooming house in Washington, DC served as the base of operations for her battlefield relief work, which would later lead to the founding of the American Red Cross. After the war, from 1866-68, she operated a “Missing Soldiers Office” in these rooms where she and her staff corresponded with the families and friends of more than 22,000 missing Union and Confederate soldiers.. 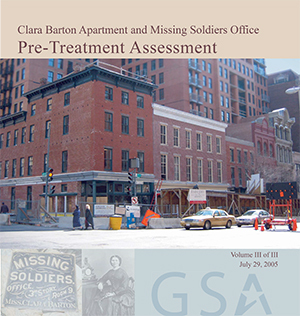 In the late 1990s, artifacts related to Clara Barton’s activities were discovered in the attic of the building, then owned by the General Services Administration (GSA), and scheduled for demolition by a private developer. Following these discoveries, the GSA retained an easement on the property, and the building was designated one of America’s Treasures and listed in the National Register of Historic Places. The GSA engaged Mills + Schnoering Architects to prepare an Interior Historic Structure Report and Pre-Treatment Report for the spaces which GSA intended to treat as an artifact of the period, but before they could begin, Hurricane Ivan hit the Washington area causing additional extensive damage to the vulnerable historic interior. The team prepared a history of the building, evaluated the materials, and made recommendations for their conservation treatment, including glazing and graining. The Mills + Schnoering Architects team completed construction documents for the full rehabilitation and restoration of the space, which now included reproduction period lighting, and a reproduction of Civil War-period wallpapers from fragments found in the space and which was a highlight of the construction process. The project also included specifications and drawing for the restoration and conservation of plaster and wood, and a mechanical system which was concealed from view. The Clara Barton Museum provides an authentic view into a mid-19th century boarding house, as well as the life of Clara Barton, a pioneer in the field of relief work in war and disaster zones. In 2015, the Friends of Howell Farm offered a three-week archaeology camp as part of the John Phillips House Site Public Archaeology Program. 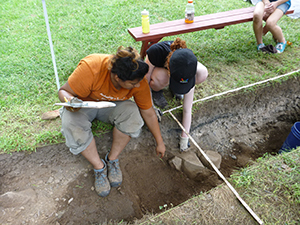 The fundamental goal was to involve students in a meaningful and actual archaeological research program, and was conducted under professional archaeological supervision and with the approval of New Jersey Historic Preservation Office. The investigations involved the excavation of five units in an effort to delineate the footprint of the John Phillips house which was associated with a farm established in the early 1700’s and which is now the Howell Living History Farm. The formal public component of the archaeological fieldwork was carried out under the direction of James Lee of Hunter Research. The goals of the camp were to provide participants with a realistic archaeological experience while trying to delineate the footprint of the John Phillips house, and obtain a clearer sense of the house’s archaeological condition so that better informed judgments might be made about the site’s potential for future display and interpretation. Specific tasks involved field preparation, orientation and in-field training of camp participants, archaeological excavation, documentation of exposed remains, analysis of the field results and recovered artifacts, and preparation of this report. The program has raised local awareness about the historical importance and archaeological potential of properties within the area. It has also proved a valuable promotional tool for the non-profit friends group and for Mercer County’s support of cultural programming. The program has been a resounding success, and the feedback was overwhelmingly positive. The Friends of Howell Farm wanted to give the visitors a chance to participate in the archaeological experience by getting their hands dirty and touching 18th century artifacts. This encouraged understanding of the long history of the area, gave them an appreciation for archaeology, and bestowed on them an ownership of the project findings. This collaboration of authors and historians tells the stories of ordinary people who lived, fought, suffered, and/or protested during the American Revolution. Through fourteen storylines, the book identifies themes and geographic regions from the Revolutionary era and provides history, images, stories, tour itineraries and maps to enhance tourism and civic pride in our communities, while also connecting people to our rich Revolutionary heritage. To bring these historic themes to life, Crossroads developed the Meet Your Revolutionary Neighbors program, of which the Crossroads website is the key tool for sharing information about the storylines. The addition of videos will help students and visitors learn in an engaging manner. 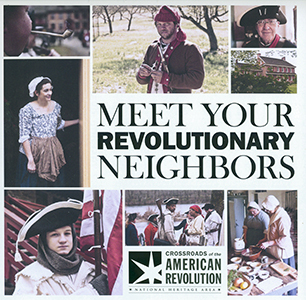 Meet Your Revolutionary Neighbors is an outstanding example of exploring the human experience and sharing the values, sacrifices, and challenges faced by New Jersey citizens during the formation of our nation. New Jersey truly is the crossroads of the American Revolution, and the state’s contributions to our nation’s history are remarkable. People fought and died here, battles were won and lost here, and the role of citizens in that struggle is one that needs to be told. The Crossroads of the American Revolution National Heritage Area is committed to connecting people to our rich Revolutionary heritage, and their mission is to connect, educate and inspire citizens of today by celebrating that history and New Jersey’s role. Tying actual stories and struggles of people from that era to the 14 storylines instills curiosity and exploration as it simultaneously develops pride and civic engagement among students, citizens, and visitors, and has been crafted to draw the reader and viewer into the life and times of the Revolutionary era. A National Register nomination was prepared for Waterloo Village in 1977, but only included the Sussex County side of the property. In 2012, the Canal Society of New Jersey received grants from the Morris County Historic Preservation Trust Fund and the New Jersey Historical Commission to expand the original nomination. Connolly & Hickey Historical Architects, LLC and Hunter Research, Inc. were tasked with preparing the new nomination. A 2009 DEP-commissioned historic preservation plan shed new light on the Village and served as the basis for the additional documentation of the Sussex County side of the historic district, while archaeology served as the main focus of the Morris County side. Hunter Research did extensive mapping and above-surface surveying to identify the archaeological resources from the 18th, 19th, and 20th century. While the original nomination dealt primarily with architectural resources, the expanded nomination increased both the physical boundaries of the historic district and the period of historical development within the Village, and therefore incorporates the potential for buried archaeological resources and the visible above-ground resources on both the Sussex and Morris County sides of the Musconetcong River. 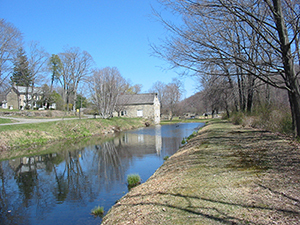 The nomination also included the portions of the Musconetcong River that run through the Village, not only for its importance to the history and development of the Village, but also the potential for buried archaeological resources. Waterloo Village, as a whole, is significant for its association with the development of New Jersey from the mid 18th century to the early 20th century, for its varied architecture that represents stylistic and vernacular trends, and for its archaeology. This nomination exemplifies the importance of updating earlier nominations lacking a complete accounting of the subject property. 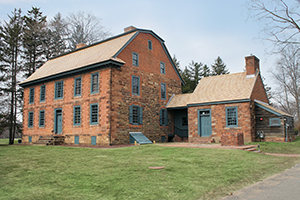 The Waterloo Village Boundary Increase and Additional Documentation was listed on the New Jersey and National Registers of Historic Places in 2015. The Jersey City Medical Center Complex first opened as the “Charity Hospital” in 1882. A new wing known as the Margaret Hague Maternity Hospital was constructed in 1928. By its completion in 1941, the complex had ten major buildings and two-million square feet in total. JCMC was not only one of the first medical centers in the United States and the first in New Jersey, but also an architectural landmark. Until its closing in 1979, it was ultimately responsible for the birth of more than 350,000 babies. In the 1980s, the buildings were included in the New Jersey and National Registers of Historic Places. In 2005 the largest residential restoration project in the country and New Jersey began at this site. Having sat vacant for decades, the Hague had sustained extensive damage from exposure to the elements. Detailed drawings assisted in the restoration and re-fabrication of missing and damaged elements. Today, the main lobby still serves as the tenants’ main entrance. The original sitting rooms remain as tenant spaces and are accentuated by the feature windows facing the street. The original plaster finishes at the ceiling have been painstakingly restored, and missing moldings replicated. Great care and sensitivity was paramount in the design and conversion to residential units. Every aspect of the unit components were designed to respect the existing architecture and preserve the grand stature The Hague represents. The new residential apartment layouts resembled the original patient rooms, and corridors, elevators, and stairwells remain in the same locations, offering new residents a taste of the grandeur of the former busy hospital. 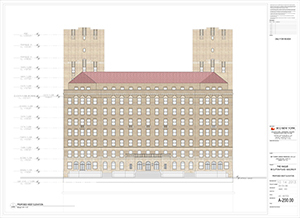 The 1936 Berthold S. Pollak Hospital for Chest Diseases was constructed as a tuberculosis hospital within the Jersey City Medical Center complex and presents the most dramatic profile of any in the complex. The building was in a deteriorated condition, having sat vacant and un-maintained since 2001, and missing the terra cotta block, coping, porch railings, and iron grill parapets of its distinctive design,. The New Jersey Historic Preservation Office holds an interior easement on the auditorium and the first floor corridor. The Beacon Criterion is the most recognized building in The Beacon complex with its stepped-wings profile that provided open-air porches for its tuberculosis patients. The adaptive reuse design effort (from institutional to multi-family rental apartment units) of this Art Deco building translated to preserving more than 75% of the original structure, conserving resources, reducing construction waste and minimizing the project’s environmental impact. The shallow depth of the former patient rooms created constraints that led to long, narrow units with lots of windows. The original plans gave ample opportunity to design multi-level ceilings which dramatically added interest to the units. Currently listed on the New Jersey and National Registers of Historic Places, the Beacon, now repurposed as a successful mixed-use development, has been recognized for the recycling effort and preservation of these historic buildings. The adaptive reuse, repurposing, and revitalization of these historic buildings within the existing community fabric of Jersey City is helping turn a depressed area into a vital, safe and pedestrian-friendly neighborhood with new and improved retail, entertainment and other amenities.